The L'Etoile family has been making fine perfumes for generations. Jac L'Etoile, who is gifted with a naturally powerful sense of smell, left the business after her mother committed suicide in the perfume workshop when Jac was young, leaving her brother Robbie to inherit the family business. But now Robbie is sure he's discovered the perfume their ancestor claims to have found centures ago: a scent that causes people to remember their past lives. And between Tibetan monks, Chinese mafia, and scientific researchers of reincarnation, everyone wants to get their hands on this secret. This book really had me wondering what was going to happen next. It's constantly flipping between different points of view, making you care for just about everyone involved, even though it's pretty obvious who you should be cheering for (umm, unless you are a communist in China who hates Buddhists; then you might see this book from a different point of view). I loved seeing how the different characters from all over the world came together as the story progressed. There was one side story in the book that I found particularly interesting, and that it turns out is actually based in fact. Of course I already knew about the persecution of Tibetan Buddhists by communist China, but what I did not know was that China put in place a requirement for people to register to be reincarnated ('cause that makes sense...). This law was created to prevent reincarnated Lamas from being identified, thus depriving Tibet of its spiritual leaders. One of the characters in this story is a reincarnated Lama who was kidnapped by the government as a child to prevent him from growing up and helping to identify the next Dalai Lama. Really interesting! I'm really fascinated by people who are trained to identify smells. When I went to Paris in high school, we toured a perfume factory, and they had us smell all these different scents and write down what we thought they were. I failed horribly. Even if something smelled familiar, I couldn't place it, and after smelling a few difference scents, my nose lost the ability to smell much of anything at all. So I loved the descriptions of all the different things Jac's nose was picking up, that other people didn't notice. 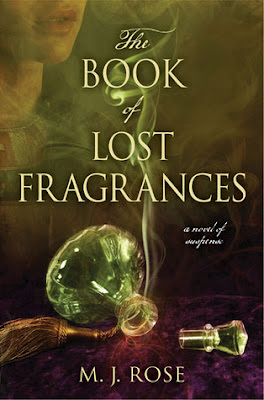 The Book of Lost Fragrances comes out on March 13, and I definitely recommend you check it out.